Louis Quinones was born in 1921 lived in Laramie, Colorado. His mother, Clara, was from Colorado and his father, Refugio, was from Mexico. He grew up in a household with his parents and nine siblings, six brothers and three sisters. He was the third oldest in his family. Although most of his family did not finish high school, the 1940 U.S. federal census indicated that Louis’ oldest brother had an eighth grade education, while Louis had seventh grade education. Instead of going to school, his brothers and sisters likely helped out on their family farm. Between 1935 and 1940 Louis moved to San Joaquin, California, where he worked in metal fabrication. He was single without a wife or any other dependents. Louis was drafted, and he reported for duty in Sacramento, California on November 30, 1942. During World War II California played a big role in the homefront. As the country began preparations for war the unemployment rate nearly disappeared. When the men began to join the military the workforce was depleted, this required women and other minority groups to join the labor force. Employers were desperate to fill positions as quickly as possible to meet production demands. California had significant oil and mineral resources, which were increased for wartime production. During this time, many people came to California seeking work. Even its southern borders were open for Mexican laborers under the Bracero Program. Furthermore, California became a training ground for the military: California's desert became bombing ranges, harbors became naval bases, and airports became air bases. Infantry and tanks rumbled across the farmlands, orchards, and deserts in preparation for war. During the 1940s, California's big cities grew, necessitating the growth of domestic infrastructure. Effective transportation networks at home helped keep the Allied supply lines active overseas. The U.S. government rationed items made scarce by the war, including gasoline, steel, rubber, coffee, butter, sugar, and meat. Rationing prevented food shortages and ensured the availability of items to service members abroad. During World War II, the federal government spent a total of $35 billion in California, or ten percent of the total spent on all domestic wartime projects. Quinones was drafted into the military and reported for duty on November 30, 1942. He entered the military as a private, joining the 35th Infantry Division, 320th Infantry Regiment. The 320th Infantry Regiment was constituted on December 19, 1942, and assigned to the 35th Infantry Division. It was activated on January 26, 1943 at San Luis Obispo, California. All units within the 35th Infantry Division moved to Camp Rucker, Alabama, in April 1943. After months of training the men were then sent to take part in the Tennessee Maneuvers from November 1943 to January 1944, where they trained on terrain similar to what they would encounter in France, Belgium, and Germany. After the Tennessee Maneuvers the men were transferred to Camp Butner, North Carolina, on January 18, 1944 to complete their final training before debarkation. They left the U.S. and arrived in England on May 25, 1944. The 320th Infantry Regiment landed with the 35th Infantry Division on Omaha Beach between July 5 and July 7, 1944. They then made their way to a concentration area two miles west of Colombières to relieve the 29th Infantry Division, who arrive on D-Day. On the night of July 9, the 320th Infantry Regiment entered battle positions. These men were highly trained but unfamiliar with the hedgerow terrain they encountered. On July 10, 1944, the men of the 320th Infantry Regiment moved into position and faced heavy mortar fire by German forces. The 320th Infantry Regiment took part in a coordinated attack between the 35th Infantry Division, the 29th Infantry Division, and the 30th Infantry Division on July 11. The 320th Infantry Regiment was ordered to push south and take the high ground between the Vire River and Saint-Lô. Private Louis Quinones died on July 11, 1944, likely during this attack. He was awarded the Purple Heart. 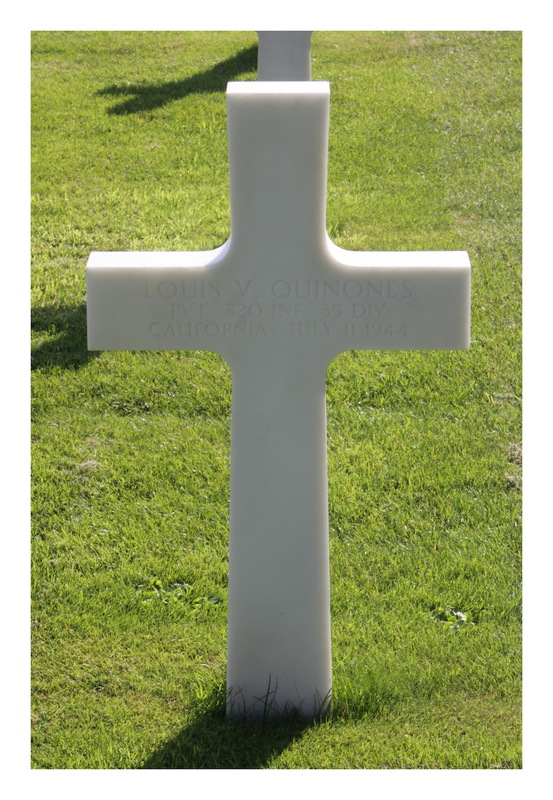 Today we pay tribute to Private Louis Quinones. He was one of nine siblings, as well as a son to Clara Quinones and Refugio Quinones. Louis was born in 1921 in Laramie, Colorado. When he was about 18 he moved to San Joaquin, California, where he worked in metal fabrication. His family always remembered him as a son, a brother, and hero. As I write this, I cannot imagine being an 18-year-old drafted into the military, knowing there’s a possibility of never seeing my family again. Quinones joined the military from Sacramento, California on November 30,1942. For an ordinary adult, going overseas would be exciting but compounding that with the knowledge and training for warfare is something else. As he witnessed several days of combat, his heart was probably racing, blood pumping, not fully grasping what was going on around him. It is all so tragic. Louis Quinones was just one life lost during the entire outcome of the war, but he was one who was deeply missed by his family and loved ones. Many of my peers thought this project was just another high school assignment but in reality it was so much more. It is the passing on of a hero's story to people who have forgotten or never knew the individual cost of freedom. Working on Louis’ memorial holds very great significance to me, in addition to a sense of pride and privilege for I accomplished, Louis and I share the same last name. This made it a bit more personal. While I am not a relative, it makes me think hopeful that someday one of his relatives will see this. Researching Louis Quinones’ early life and military experience was not provided in an ordinary high school textbook, we had to dig in a little deeper. Finding and analyzing census records brought Louis to life for me. It was as though he was right in front of me and I was asking him the information. The information I dug up made this project more rewarding because through all of the life choices that Louis had made and the sacrifice he gave, made me appreciate him and all those who laid down their life for my freedom. Knowing that he is just one of the millions of lives lost due to war puts into perspective how valuable life is. How can anyone have the courage to put their lives on risk to save others lives? Louis must have had hopes, dreams, responsibilities; I wonder if he truly understood how important his contribution to the war was in the overall victory? Completing this project has made me a more proud and inspired member of this country. 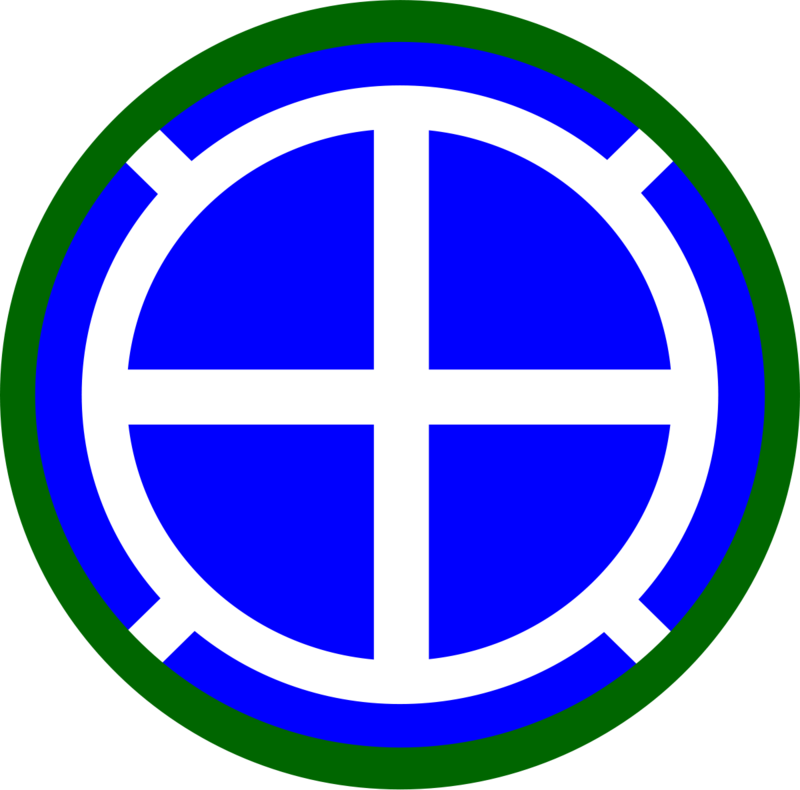 35th Infantry Division. Presenting the 35th Infantry Division in World War II, 1941-1945. Atlanta: Albert Love Enterprises, 1946. https://archive.org/details/PresentingThe35thID. California. San Joaquin County. 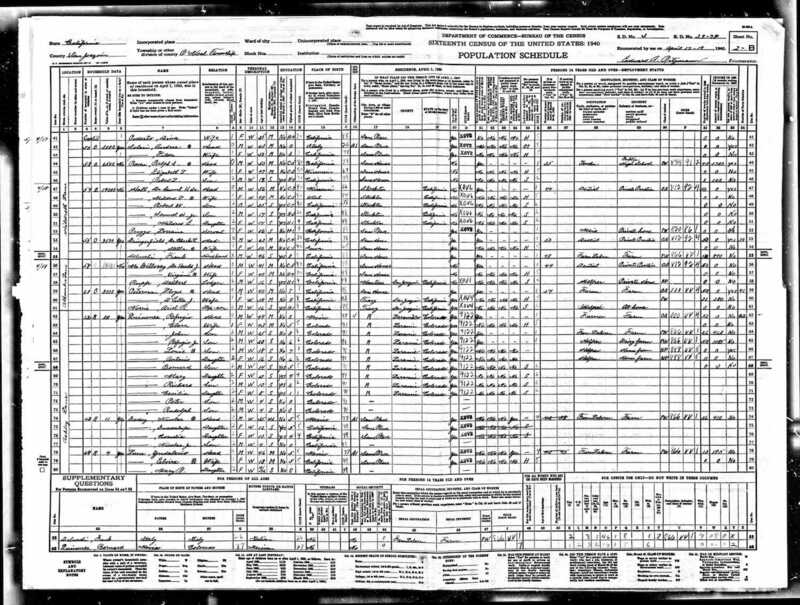 1940 U.S. Census. Digital Images. http://ancestry.com. 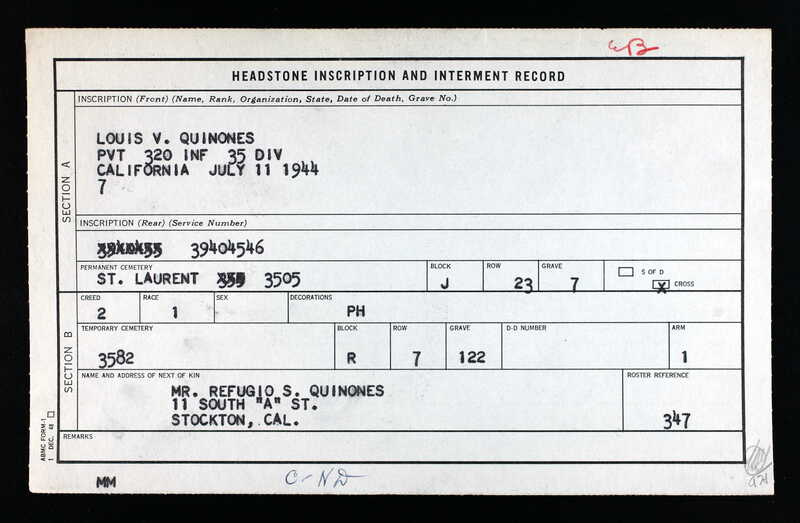 Louis V. Quinones, Headstone and Interment Records for U.S. Military Cemeteries on Foreign Soil, 1942-1949. Digital images. http://ancestry.com. Louis V. Quinones; World War II Army Enlistment Records, 1938-1946 [Electronic File], Record Group 64; National Archives and Records Administration [retrieved from the Access to Archival Databases at https://aad.archives.gov/aad/, October 5, 2017]. Miller, C.R. "We’re Fighting to Prevent This". Poster. National Archives and Records Administration (NWDNS-44-PA-2376). 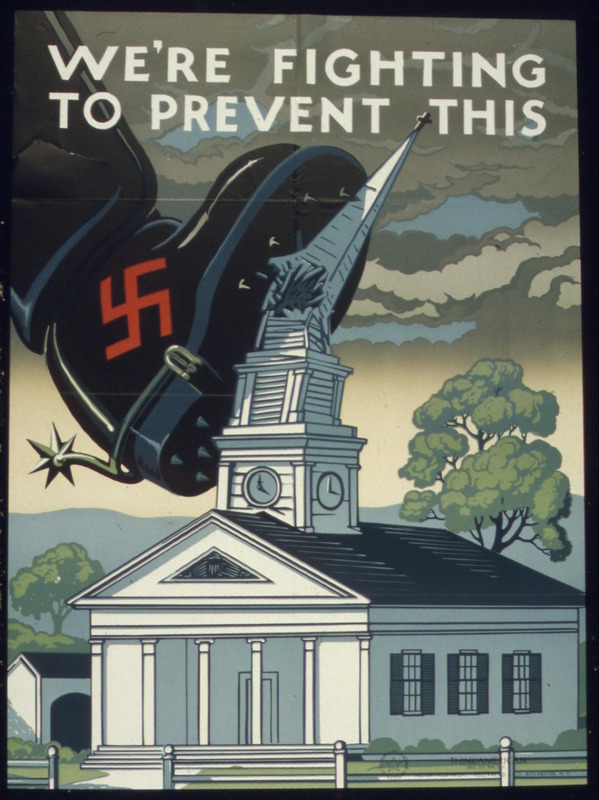 https://www.archives.gov/exhibits/powers_of_persuasion/warning/images_ht.... Image. "320th Regiment Lineage." U.S. Army Center of Military History. Updated September 30, 2005. Accessed October 20, 2017. https://history.army.mil/html/forcestruc/lineages/branches/regt/0320rgt.htm. "California and the Second World War." California Military Museum. Accessed May 25, 2017. http://www.militarymuseum.org/HistoryWWII.html. “Camp San Luis Obispo.” California Military Museum. Accessed May 25, 2017. http://www.militarymuseum.org/HistoryWWII.html. 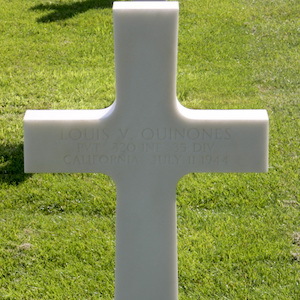 “Louis V. Quinones.” American Battle Monuments Commission. Accessed February 2, 2017. https://abmc.gov/node/412793#.WepI21tSzIV.